Who knew a conditioner could do so much for hair growth? Yes, it’s not just our shampoos and serums which aid healthy hair- every step of your Grow Gorgeous routine helps your hair getting long and strong. Our advanced hair and scalp conditioning formula works to increase hair thickness and restore softness. An innovative form of hyaluronic acid is blended with amino acids, Biotin and B-vitamins that addresses hair thinning by stimulating hair follicles for a fuller appearance and dramatically improved hair density. 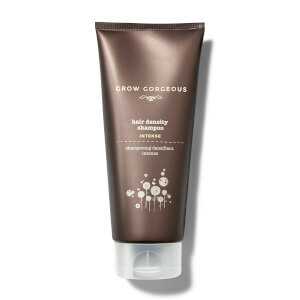 For best results use with Grow Gorgeous Hair Density Shampoo Intense. Hair Type: Fine hair. Suitable for coloured or natural hair. Niacin is known to play an important role in cellular repair. Applied to hair it works on weak and brittle hair by creating a beautifully healthy, flake-free scalp for healthy hair to grow upon. 8 amino acids inject the hair with protein for an increased look of lustre and intense conditioning. Charged Hyaluronic Acid swells each strand for a smoother hair surface which is soft to the touch. 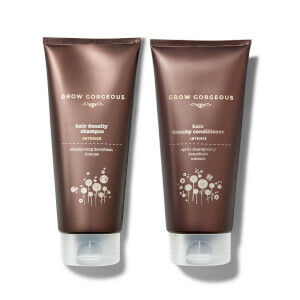 Apply a generous amount to wet hair after using Grow Gorgeous Hair Density Shampoo. Massage into the scalp (yes, this conditioner can be used on your scalp – trust us!) and smooth through to hair ends. Leave on for 1 minute. Rinse thoroughly and style as usual. Aqua (Water), Niacinamide, Cetyl Alcohol, Parfum (Fragrance), Ethoxydiglycol, Glycol Distearate, Behentrimonium Chloride, Hydroxyethylcellulose, Hydroxypropyltrimonium Hyaluronate, Arginine, Biotin, Inositol, Acetyl Cysteine, Acetyl Methionine, Panthenyl Ethyl Ether, Glycine, Alanine, Serine, Valine, Proline, Threonine, Isoleucine, Phenylalanine, Aspartic Acid, Histidine, Sodium PCA, PCA, Lactose, Milk Protein (Lactis Proteinum), Sodium Lactate, Sodium Citrate, Urea, Citric Acid, Phytic Acid, PPG-26-Buteth-26, PEG-40 Hydrogenated Castor Oil, di-Sodium Hydrogen Phosphate, Caramel, Isopropyl Alcohol, Alcohol Denatured, Diethyl Phthalate, Phenoxyethanol, Chlorphenesin, Alpha-Isomethyl Ionone, Linalool, Limonene, Butylphenyl Methylpropional, Hydroxyisohexyl 3-Cyclohexene Carboxaldehyde. A very thick concentrate with a lovely smell goes with the shampoo which also is a great product. Will continue to use along with the shampoo and serum. This along with the shampoo and serums are just a wonder. I'm 38 and have searching for a product that helps my fine flat hair. This range really does work. Amazing! I use this with the density shampoo and I wouldn't go back to another brand. This stuff smells so lovely and makes my hair feel great! I used this along with the Hair Growth Serum and noticed a massive difference in my hair in such a short time! Grow Gorgeous, you have transformed my hair! Cannot recommend enough! I used the shampoo and conditioner and saw a hug difference in my hair. It felt thicker, softer and more manageable. I would highly recommend it to blondes who have limp lifeless hair and to anyone who feels there hair is too thin and drab. I love it.